The Wilderness Act defines wilderness as "as an area where the earth and its community of life are untrammeled by man, or man himself is a visitor who does not remain." The Act further defines a wilderness area as "land retaining its primeval character and influence, without permanent improvements or human habitation,... which (1) generally appears to have been affected primarily by the forces of nature, with the imprint of man's work substantially unnoticeable; (2) has outstanding opportunities for solitude or a primitive and unconfined type of recreation; (3) has at least 5,000 acres of land or is of sufficient size as to make practicable its preservation and use in an unimpaired condition; and (4) may also contain ecological, geological, or other features of scientific, educational or historical value." Also established through an Act of Congress, this designation protects the scenic, cultural, historic, recreational and natural resources in specific areas, while allowing compatible uses. Typically, an NSA is protected from roadbuilding, logging, energy development, and other activities that would mar the natural character and recreational value of the area, while allowing motor vehicles and mountain bikes (unlike a wilderness area). Where are existing Wilderness Areas in Virginia? Virginia has 24 Wilderness areas. To see a complete list, with descriptions and maps, go to the wilderness.net. 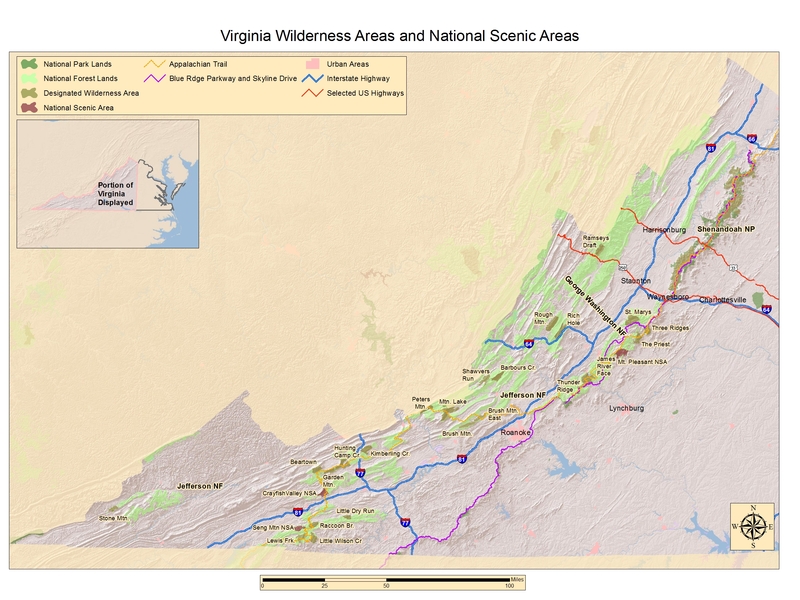 Also, see the attached map of Virginia Wilderness and National Scenic Areas. Does wilderness designation lock natural forests into single use opportunities? "Some people, because commercial logging is prohibited in wilderness, claim that wilderness is 'single use' rather than 'multiple use' and without looking into the matter further , oppose wilderness. As a matter of fact, wilderness is recognized as one of the multiple uses in the Multiple Use and Sustained Yield Act. Further, of the principal multiple uses enumerated in that Act, wilderness very effectively serves the conservation of water and soil; provides undisturbed habitat for many species of wildlife; recreation is a prime use; and grazing (also called "forage") may be permitted under the Wilderness Act. While the harvesting of timber is definitely prohibited, it is the living forest-not the clear cut or heavily cut over land-which holds back the water and controls erosion; which purifies air; which provides essential habitat necessary for food, shelter and breeding of specific species of animals and birds; and which is beauty an inspiration for mankind. Wilderness is multiple use." Yes. If state and federal law otherwise permit hunting or fishing within a candidate area, the designation of wilderness does not affect its availability for these uses. Therefore, hunting and fishing continue to be allowed in Virginia's National Forests after an area is designated wilderness. Can previously logged areas be designated wilderness? Yes. Wilderness is defined as an area of federal land "retaining its primeval character and influence...which generally appears to have been affected primarily by the forces of nature, with the imprint of man's work substantially unnoticeable." This language was drafted particularly to provide for the preservation of wild land in the East. Thus, lands which have been impacted by man but which are returning to their natural state are eligible for designation. Consequently, evidence of prior timber harvests and dirt roads do not automatically disqualify candidate sites. The key is that the imprint of man's prior work be substantially unnoticeable. What is a "roadless area"? Roadless areas in the National Forest are generally free of roads and development. The "Inventoried Roadless Area" (IRA) was originally defined and protected by Presidential mandate, and exemplifies the difficulties associated with administrative designation. Over the years, the Roadless Rule of 2001, which prohibits new road-building in roadless areas, has been overturned and reinstated by multiple courts. As of November 2011, the rule is in place after being upheld by the 10th Circuit Court in October, 2011. Does wilderness designation restrict the use of private land? No. Only federal lands can be designated as wilderness areas. In addition, the Act has provisions to ensure that private land, "landlocked" by wilderness sites, remains accessible to use by the owner. Yes, with hand tools. Existing foot and horse trails and trail shelters are generally deemed consistent with the purposes of the Act and may be maintained. But new trails and shelters may not be built because they would constitute development within the designated wilderness, contrary to the Act. How do wilderness bills get passed? The steps in the passage of a wilderness bill are explained here.